Introducing Justin! Our 2018 Walk Ambassador! Justin’s entrance into this world was exciting but scary, beautiful but heartbreaking. He was born with a very rare neurological condition called lissencephaly, which causes his brain’s surface to be smooth and leads to significant developmental delays. To give him the specialized care he needed, Justin was immediately transferred from our local hospital to CHOC Children's, where he remained in the neonatal intensive care unit for four months. Unfortunately, Justin’s diagnosis was at the most severe end of the spectrum. Like all children with lissencephaly, Justin is severely neurologically impaired. He has several seizures a day and is fed through a feeding tube. Though most children with his condition do not survive their first year of life, Justin has defied the odds. With the love of his family and friends and the support of the excellent medical team at CHOC, our 11-year-old son continues to fight. Justin's chronic condition has made him a frequent visitor at CHOC. He receives care from doctors in six specialties- neurology, gastroenterology, pulmonology, metabolic, urology, and orthopedic. 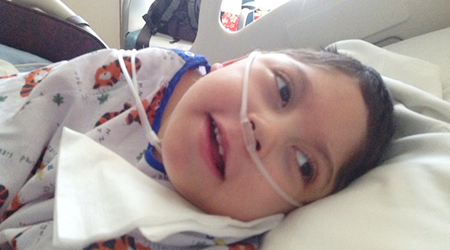 Justin’s doctors have the medical expertise to help us keep him healthy, safe and comfortable. For the first few years, Justin required long hospital stays two or three times a year to treat his seizures and pneumonia. The staff at CHOC worked around the clock to keep Justin stable helping him recover so he could come home. Though no one really wants to go to the hospital, CHOC provides a warm, inviting, family-centered environment, making it a home away from home for our family. With the care he has received at CHOC, Justin’s condition has stabilized. For the past two years, he has only required outpatient treatment. To show thanks for CHOC, our small group of nine joined the 2012 CHOC Walk and raised $1,500. Seeing family members and friends represent their loved ones by raising funds to help others was a life-changing experience. Since that time, our team has grown significantly. In 2017, Justin’s Helpers grew to almost 400 walkers, raising over $51,000. Family members, friends, students, and faculty representing Rancho Cucamonga High School, St. Lucy’s Priory High School and Chaffey High School work together to support CHOC Children’s. Our mission is growing, too. In addition to walking, our team makes soft and colorful “Jussy Bear” blankets. These blankets are distributed to patients helping to keep the brave children facing medical challenges warm and cozy during their hospital stay. Our CHOC Walk Bunco Fundraising Night has become an annual event. Just as his medical team has supported Justin, we will continue to support CHOC. "CHOC reminds us to appreciate and celebrate the most important things in life." We are grateful and honored that Justin has been named the 2018 CHOC Walk Ambassador. Justin is truly a blessing. The strength and bravery of all children facing challenging medical conditions and disabilities inspire us. We are thankful for the care CHOC provides families in our community. Walking for Justin and for the children at CHOC reminds us to appreciate and celebrate the most important things in life...health, family, and community.